The Casino was founded in 2009 and is part of the renowned Casino Rewards Group, a long-standing online Casino group. The Casino is also owned by Technology Services Trading Limited and is licensed by the Kahnawake Gaming Commission. Having been in business for almost a decade now, the Casino has continued to offer punters an enormous selection of slots and games. The Casino is also approved by eCOGRA, has a solid customer support team, and offers a welcome bonus for new players as well as in-play promotions for already existing players. At Quatro Casino, the welcome bonus is quite a unique one. 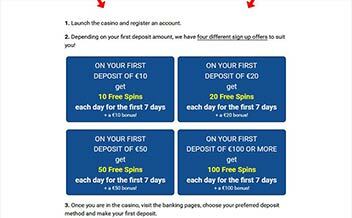 Upon signing up, the player gets €100 worth of scratch cards. The player can use the money to play on either the scratch cards or on other games within the Casino. Only €1 is required to activate the bonus. To withdraw the winnings, the player is required to wager the amount at least 30 times. Although the Casino does not have a promotion page, there are usually bonuses that are given out regularly throughout the week. 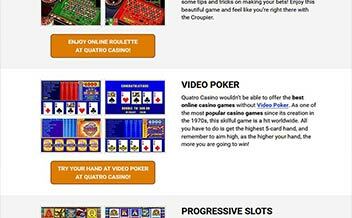 Quatro Casino has one of the most exciting list of slot games that is available for punters to enjoy. 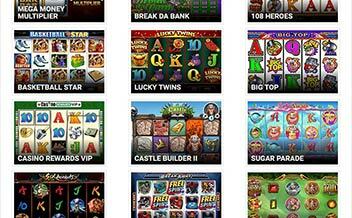 This section features some of the most incredible and rewarding Microgaming slot games. Some of the games include Avalon, Jungle 7’s, Agent Jane Blonde, Cash n’ Curry, among others. The Casino also has an amazing assortment of table games that are tailored to enhance the player’s experience while also increasing their chances of winning big. Developed by the renowned Microgaming, the games include Blackjack and Roulette variants, Sic Bo, and Craps. The video poker section is another that is action packed with lots of thrilling online casino games that will have you on the edge of the seat. Some of the video poker games available at the section include SupaJax, Deuces Wild, All Aces, Jacks or Better, among others. The Casino’s software is solely powered by the renowned Microgaming. The design of the software is stylish and integrated to ensure that the player navigates through seamlessly. Microgaming boasts of producing one of the most enticing slots and games which means that players are guaranteed of an amazing experience when playing at the Casino. Additionally, the Casino is certified by eCOGRA. The United Kingdom, the United States, Italy, Romania, France, Belgium, Australia, Albania, Hong Kong, Lithuania, Israel, Maldives, Libya, North Korea, Peru, among others. Bank Wire Transfer, Visa, Ecopayz, PayPal, iDEAL, Paysafe Card, Visa Electron, Master Card, Skrill, NeoSurf, Trustly, PostePay, EntroPay, eWire, InstaDebit, among others. 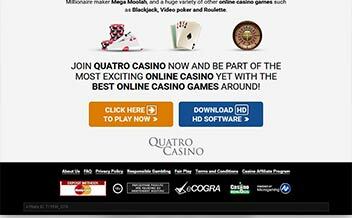 Quatro Casino can be accessed on download, instant play, and mobile devices. This ensures that players can enjoy their preferred games seamlessly from the comfort of their home and while on the move. The Casino supports major web browsers and can be accessed using either Android or IOS devices. Quatro Casino is certainly a great place to try your luck. The Casino is run by competent management which offers an enormous selection of games, has fast payment processing, offers players incredible bonuses, and is certified by eCOGRA.